Spinach salad has never tasted so good. Crisp cucumbers balance out sweet-tart raspberries, while fresh spinach and a berry vinaigrette round out this super starter. For a change of pace, prepare using Kraft Calorie-Wise Catalina Dressing flavoured with a splash of fresh lime juice. 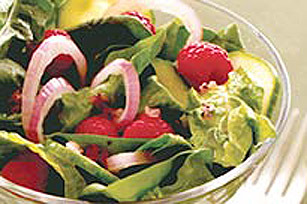 The spinach in this flavourful salad provides an excellent source of vitamin A.